This is a very famous and traditional dish of Karnataka especially Udupi. 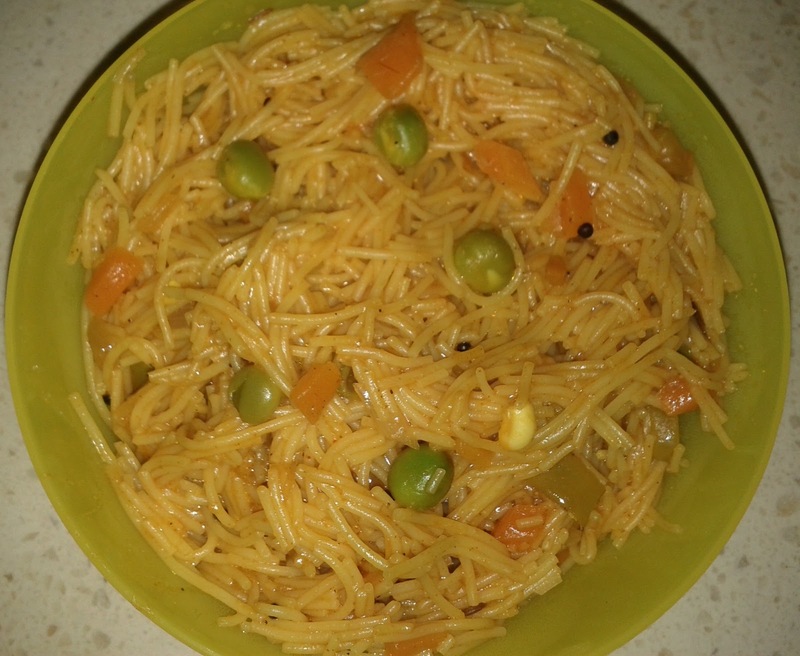 This dish is usually made out of rice vermicelli / shavige / thin noodles. It is a very simple and easy recipe. Best for lunch and breakfast. This dish has different variations. The color and ingredients like tomato, vegetables, lemon etc can be adjusted based on the availability. Can use any types of vegetables if available or can simply skip adding any vegetables to it. Similarly, people who likes it to be colorful and spicy can add turmeric and red chilly powder instead of green chilies. Thus, this dish can be either red, yellow or white in color. If you don't have lime water(Lemon juice) then use raw mango or tomato instead . Can use even wheat vermicelli instead of rice vermicelli. Vermicelli must be roasted properly else the upma will become sticky. The vermicelli can also be roasted and preserved in advance for future use or you can buy already roasted vermicelli instead. 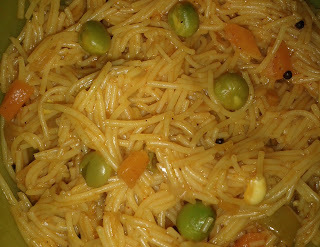 Some people use grated coconut and cashew for garnishing. I am using beans, peas and carrots. You can also add capsicum and cabbage. Dry roast the vermicelli in an pan until light brown on low flame if you are using unroasted vermicelli. Set 3 cups water to boil. Heat oil in a pan. Add split urad dal, mustard seeds, cumin seeds, green chilies and curry leaves. Fry until mustard seeds starts to pop. Add sliced onions and saute for few minutes until it turns translucent. Then add chopped vegetables,turmeric powder and salt. Saute for 3 minutes until vegetables are boiled. Now add the roasted vermicelli and pour the boiled water on top of it and mix slowly. Close the lid and allow vermicelli to get cooked properly for maximum 5 minutes until water evaporates. Sprinkle lemon juice on it. Switch off the flame, garnish it with coriander leaves and coconut if needed.